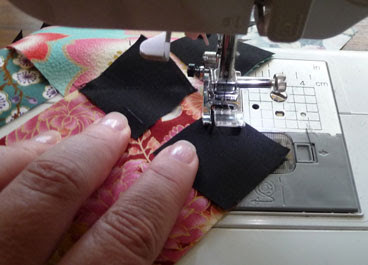 Up until now I've been pretty consistently using polyester batting for my quilts. I felt that I was making a "safe" choice (I want my quilts to be washable). I almost - ALMOST - bought wool batting, but my friend Dianne told me about a quilt that she made with wool batting that was completely ruined when her daughter threw it into the washing machine - and then the dryer. She showed me a photo and, well, heartbreaking. So I've steered away from wool. Looking at the other choices available in the shop where I've been buying my batting ("Spotlight"), it seemed it's pretty much wool, cotton, or polyester. Polyester is the cheapest of the 3, so there you go. 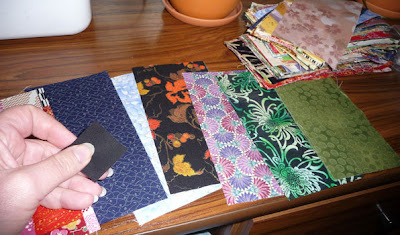 I went this afternoon to pick up batting for Quilt 10 (a Japanese print quilt kit). 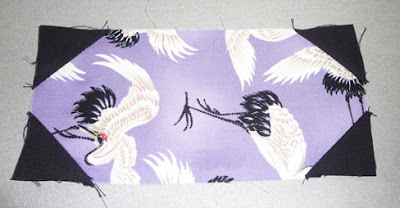 I decided to stop in at the quilting shop in Tecoma ("Foothills Fabric and Threads") and see what they offer. The woman who waited on me - Sandra - is a brilliant quilter, and very experienced. Talking to her I found there's yet a 4th choice: Batting that is a blend of cotton and bamboo. You read that right... bamboo batting. I wasn't sure at all about it, but Sandra showed me a quilt she's working on now - and I love how the batting sits between the layers. 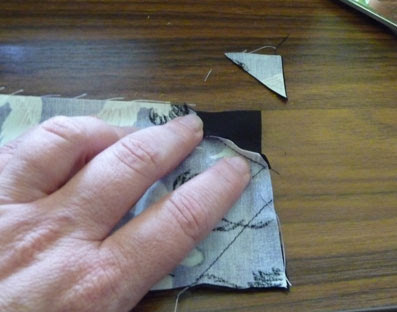 She said that she's finding this batting is just fabulous for hand quilting - the needle just slides through effortlessly. It wasn't the cheapest - $22 a meter - but if it's easier to work, then it's worth it for that alone. 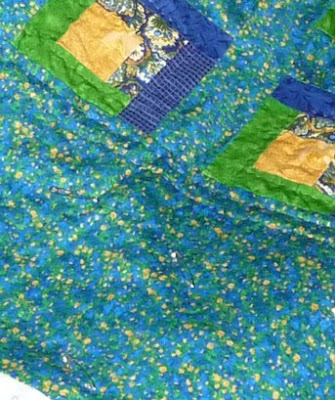 And, again, looking at her quilt I was amazed at how light and lovely the feel was. A couple of weeks ago I mentioned quilt 10 - the "Forbidden Palace" kit that I got at the store "Patchwork With Gail B". Well, the time has finally come to launch that project. 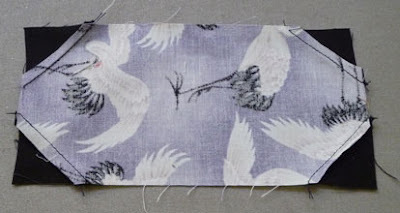 The kit comes with 80 squares of glorious Japanese prints (each square a different print). It also comes with a length of plain black cotton. First you cut out 640 1.5 inch squares out of the black (there's a good bit of black cotton left over after this - that will be used later for the border and binding). 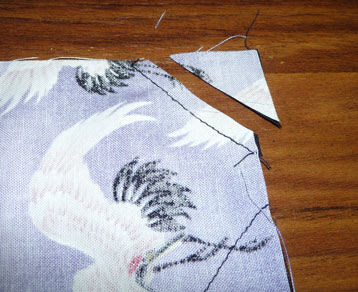 Next you cut the squares in half to product rectangles. The result is a rectangular "snowball" block. Now to finish the remaining 159 blocks. I estimate it will take about 2-3 hours. With this quilt design, the effect of the black corners on each block is to create a kind of "stained glass window" effect with the various prints. It's stunning! I've done snowballs twice before - my first and third quilts used this type of block. 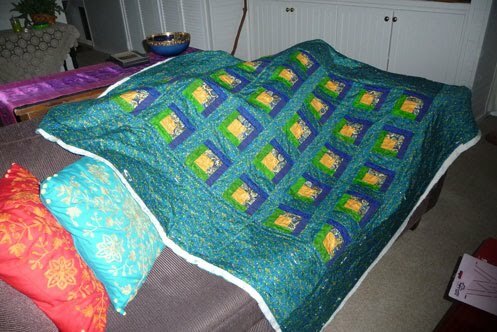 The third quilt (like this one) was a kit from the same store - and it's overall design was VERY similar (a mix of blocks, each with a different print). I remember with that third quilt that it took quite a bit of time and thought to decide which blocks to put next to each other. This one will take a bit of time, too (not really sure how much, but we'll see). Last September I told you about my "disasterous" design for Quilt 5 - a blue/green log cabin. Well.. I'm getting close to finishing this beast - finally - and can report now that I'm starting to feel better about the goof. The problem I had with this quilt is that I dove in without completely calculating the required yardages - and even starting piecing the top! 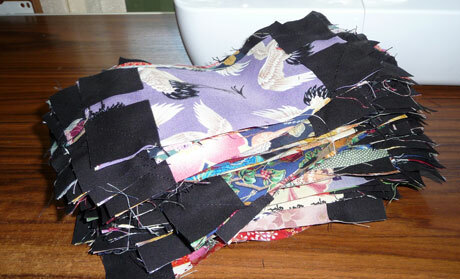 I had lovely log cabin blocks which I stitched together with a lattice-like border between each. Looked lovely but suddenly I found that the overall top was going to be much, much smaller than I wanted it to be. And so - I adjusted by making the outer border much wider. Oh dear... it just looks awkward. But I'm getting over it - and have even found a new "spin" on this one and am starting to actually LIKE it. The thing I've been wrestling with is all that busy block stuff happening inside a "sea" of teal blue border. But you know what? Hm... well.. this quilt reminds me a little of photos of galaxies. So I've decided to name it "Cosmos" and love it as it is. I love the teal blue with flecks of yellow, navy, and green. Like stars in the heavens. And my log cabins are like orderly galaxies swirling in the middle.